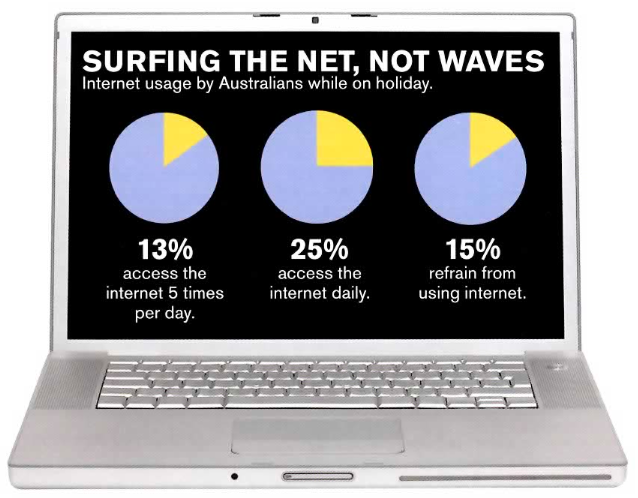 Internet use on vacation: Good or bad idea? Published on January 11, 2011 in Mistakes To Avoid, Professional Development Tips and Time Management. 1 Comment Tags: Internet Use On Vacation, Playcation, Work-Life Balance, Workation. I’ve blogged about taking workations and playcations on this or another one of my many blogs. Simply put, it’s about combining work and pleasure so you can establish more of a work-life balance. That being said, I am not advocating you work like a dog, then take a vacation and keep working. What I’m advocating is PLANNING to work through a few days “off” so that you’re not stressed before you leave and when you get back. There is an all-important nuance here that it must IMPROVE your work-life balance – if it doesn’t, then disconnect completely. Chances are you don’t have the discipline to do this, but if you do, I can tell you it’s an amazing liberation which EXTENDS the time you can ‘afford’ to be away. Instead of taking the weekend off (2 days), you can plan to take 3, 4 or even 5 days off – WITH NO LOSS OF PRODUCTIVITY. I do this for this very reason. If I allow myself an hour or two a day to work online while on vacation, then I can allow myself to take more time off during vacation. I usually work while my family is sleeping, or doing something else without me. This way, I don’t feel left out or neglected, but I still get my needed tasks completed. It does take discipline, though. You have to know just what you plan to do, and get it done quickly, or else you will just be wasting your precious vacay time online doing things you could have done at home.